"Va, pensiero" (Italian: [ˈva penˈsjɛːro] ), also known as the "Chorus of the Hebrew Slaves", is a chorus from the opera Nabucco (1842) by Giuseppe Verdi. It recollects the period of Babylonian captivity after the loss of the First Temple in Jerusalem in c. 500 BCE. The libretto is by Temistocle Solera, inspired by Psalm 137. The opera with its powerful chorus established Verdi as a major composer in 19th-century Italy. The full incipit is "Va, pensiero, sull'ali dorate", meaning "Go, thought, on golden wings". Psalm 137 is the 137th psalm of the Book of Psalms, and as such it is included in the Hebrew Bible. In English it is generally known as "By the rivers of Babylon", which is how its first words are translated in the King James Version. It is Psalm 136 in the slightly different numbering system of the Greek Septuagint and the Latin Vulgate versions of the Bible. Its Latin title is "Super flumina Babylonis". Indro Alessandro Raffaello Schizogene MontanelliKnight Grand Cross OMRI was an Italian journalist and historian. Generally considered one of the greatest Italian journalists of the 20th century, he was among the 50 World Press Freedom Heroes of the previous 50 years named by the International Press Institute in 2000. He distinguished himself for his original approach to writing history in books such as History of the Greeks and History of Rome. 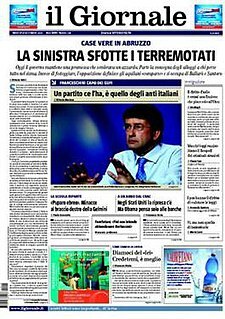 il Giornale is an Italian language daily newspaper published in Milan, Italy. Upon Verdi's death, along his funeral's cortege in the streets of Milan, bystanders started spontaneous choruses of "Va, pensiero". A month later, when he was reinterred alongside his wife at the Casa di Riposo, a young Arturo Toscanini conducted a choir of eight hundred in the famous hymn. Va' pensiero Padania was a Northern-Italian electoral list for the 2001 general election. 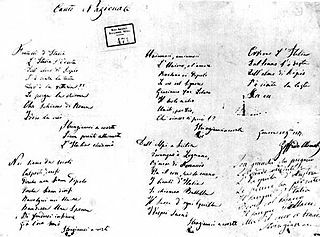 Il proscritto (1841), revised as Die Heimkehr des Verbannten (1844) is an opera by Otto Nicolai. ↑ Francesco Izzo, "Verdi, the Virgin, and the Censor: The Politics of the Cult of Mary in I Lombardi alla prima Crociata and Giovanna d’Arco", Journal of the American Musicological Society, 60 (2007): pp. 557–597. ↑ "Senator wants to change Italy's national anthem – to opera". Christian Science Monitor. 24 August 2009. ↑ "Riccardo Muti conducts audience during Rome performance". Chicago Sun Times. 12 March 2011.